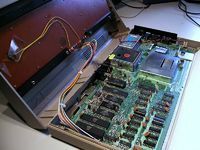 A computer system: An opened C64. A computer or a computer system is a calculator system for data processing. The computer works with commands (a serie of commands is called a computer program). The firmware cordinate the teamwork of the hardware (like keyboard, memory, disk drive, hard disk drive, etc.) and the software (like operating system, applications, games, tools, etc.) is needed for simply work with a computer system. Also is a computer a system, that contains a central processing unit (short: CPU, or also processor), which processed the infos or datas. The datas are binary digits, which combined by addition, subtraction or by operators like AND, OR, NOT. This page was last modified on 19 September 2016, at 01:54.